It is easy to create a new Table from an existing Table Level Backup. The new Table will be an exact copy of the original Table at the moment that the backup was created. The following step-by-step guide demonstrates how to accomplish this. Open the Table from which the Table Level Backup was created. Click on the Tables System Tool. Click the desired Table to open it. Open the 'Edit Table' modal from the Table Menu. Click the Table Menu icon to open the menu. Click on Edit Table in the drop-down menu. 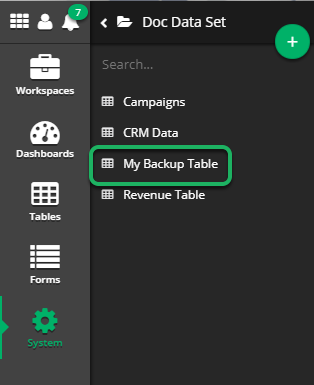 Scroll down and click the 'Create New Table From Backup' button. In the left column of the modal, the Table Info, scroll down until the button labeled Create New Table From Backup is visible. 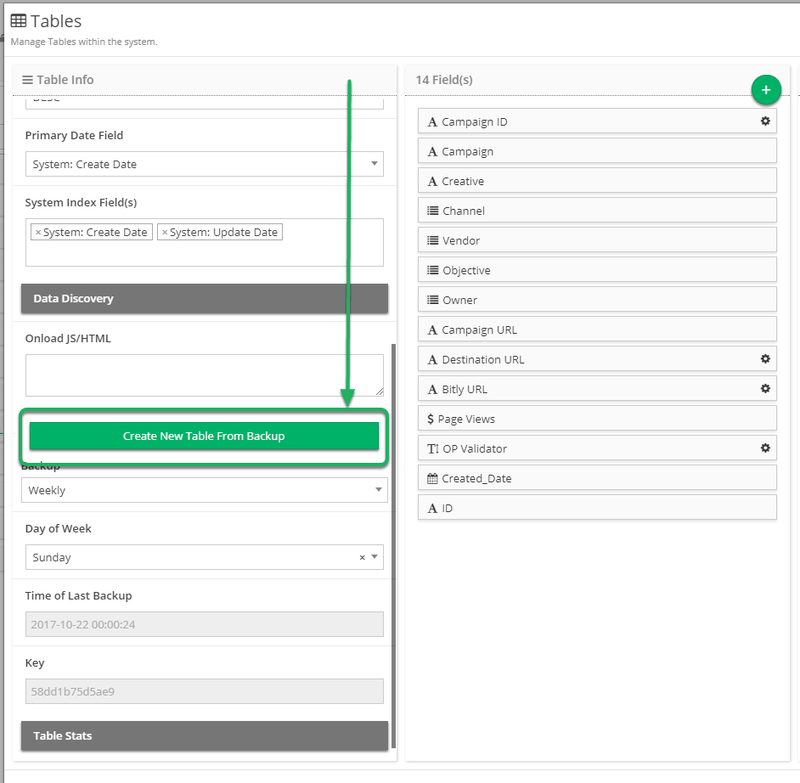 Click the button to open the Create New Table modal. Fill out the 'Create New Table' modal. Backup Name: The name that the new Table will be identified as in the system. Backup Date: A drop-down listing all available backup dates that may be used to create the Table. 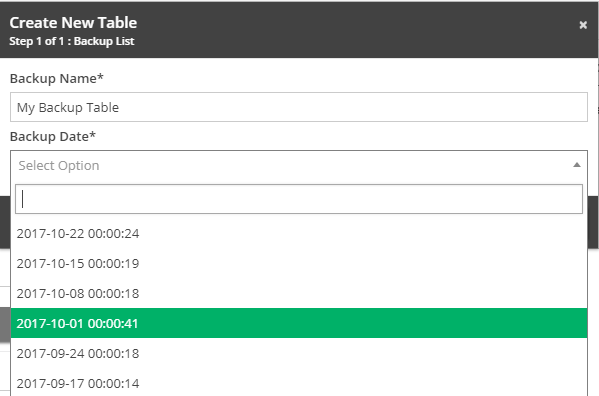 Name the new Table and select a date to be restored from. The new Table is created in the same folder as the original. The Table now contains all of the backup data. Prev: How do I create Linked Dropdowns? 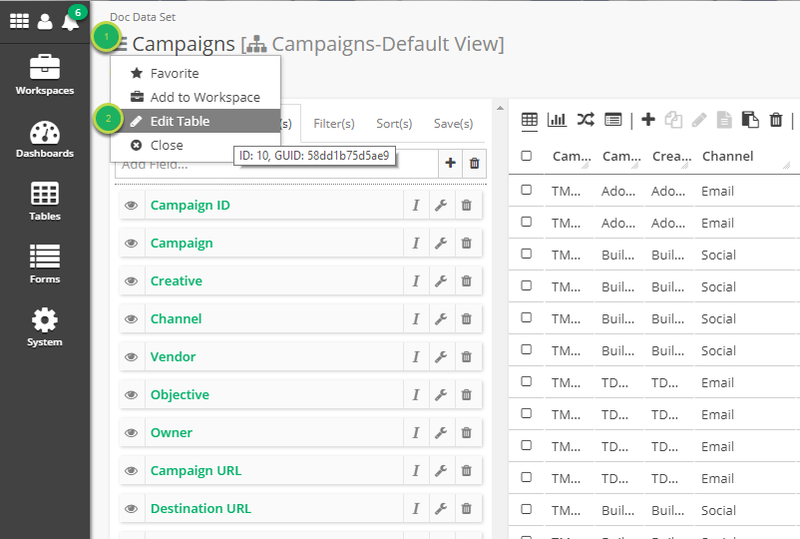 Next: How do I create a table using an Adobe Campaign Classification Connector? 1.1 How do I Login? 1.2 How do I Log In with Multiple Customers? 1.3 How do I Log Out? 1.4 How do I change my Password? 1.5 What if I forget my Password? 1.6 How do I Login via Adobe Analytics Account? 1.7 How do I change my Profile Information? 1.8 How do I change my Default Theme? 1.9 How do I create a user group? 1.10 How do I create a new user? 1.11 How do I enable SSL on my account? 1.12 How do I download the SSL cert files for my account? 1.13 How do I use MySQL Workbench to connect to my database using SSL? 1.14 How do I use Tableau to connect to my database using SSL? 2.1 What are the Platform System Elements? 2.2 What is the Window Switcher used for? 2.3 What is the User Tools Icon used for? 2.4 What is the Notifications Icon used for? 2.10 What are Favorites and how do I Navigate to them? 2.11 What is Most Recent and how do I Navigate to them? 2.12 How do I navigate through Folders? 2.13 How do I change my Notification Settings? 3.1 What are the Fix (Table Grid View) Elements? 3.2 How do I Select Records? 3.3 How do I Refresh data in Fix (Grid View)? 3.4 How do I switch between Fix (Grid), Flare (Chart), Flow (Visualizer), and File? 3.5 How do I change the number of Records seen in Fix (Grid View)? 3.6 How do I view Table Notes and Documentation? 3.7 How do I use Pagination in Fix (Grid View)? 4.1 How Do I Add Records? 4.2 How do I Copy records? 4.3 How do I Edit records? 4.4 How do I Edit records by text? 4.5 How do I Delete records? 4.6 How do I Import records via Copy & Paste? 4.7 How do I Import records via a Manual File Upload? 4.8 How do I Import records from another Table? 4.9 How do I Import records via Drag & Drop? 4.10 How do I Export a File to desktop? 4.11 How do I Export using a Connector? 4.12 How do I Export a File to Email? 4.13 How do I Export a File to Web? 4.14 How do I Export records via Copy & Paste? 4.15 How do I see specific field/cell/column content if too large in the grid? 4.16 How do I set a cell to NULL? 4.17 How do I Filter using With This Value/Without This Value? 4.18 How do I create a Pivot View? 4.19 How do I Reset Grid View? 4.20 How do I Delete ALL records? 5.1 How do I Freeze column(s)? 5.2 How do I limit my Data by Limiting the List? 5.3 How do I Find and Replace within a Column? 5.4 How do I Expand a column? 5.5 How do I Expand All column(s)? 5.6 How do I Quickly Filter? 5.7 How do I Adjust my Column Width? 6.1 What are the available System Fields? 6.2 What are the Fix(Grid View) Configurator elements? 6.3 How do I manage which Fields are shown in the view? 6.4 How do I manage what Order Fields are shown? 6.5 How do I manage what Values, Counts, or Aggregates are shown? 6.6 What are all possible Value, Counts, or Aggregates available? 6.7 How do I change what is shown for a Field Name? 6.8 How do I create a View Mashup Field? 6.9 How do I Filter in Fix (Grid View)? 6.10 What are the available criteria types? 6.11 How do I create Advanced Filters in Fix (Grid View)? 6.12 How do I manage the Sort Order of my Data? 6.13 How do I open a table in Card View? 6.14 How do I Clear Filters? 7.1 Important: Change in mashup field functionality! 7.2 What is the difference between View Mashups in Grid View and Table Mashups? 7.3 How do I create a Basic Field Mashup? 7.4 What are the available functions, values, and options for Field Mashups? 8.1 How do I save my configured View as a Table? 8.2 How do I save my configured View for later? 8.3 How do I set a saved View as my Default View? 8.4 How do I remove a Default View? 8.5 How do I save my configured View to a Dashboard? 8.6 How do I save my configured View to share with others? 8.7 How do I share my View with other users? 8.8 How do I save my configured Chart for later? 8.9 How do I save my configured Chart to a Dashboard? 8.10 How do I share my Flare with other users? 8.11 How do I remove a saved View? 8.12 How do I remove a saved Chart? 8.13 How do I open a saved View? 8.14 How do I open a saved Chart? 8.15 How do I save my configured View to use in Excel? 9.1 How do I create a Column Flare? 9.2 How do I create a Spline Flare? 9.3 How do I create a Line Flare? 9.4 How do I create a Scatter Plot Flare? 9.5 How do I create a Stacked Column Flare? 9.6 How do I create a Percentage Stacked Column Flare? 9.7 How do I create a Bar Flare? 9.8 How do I create a Stacked Bar Flare? 9.9 How do I create a Percentage Stacked Bar Flare? 9.10 How do I create an Area Flare? 9.11 How do I create a Stacked Area Flare? 9.12 How do I create a Percentage Stacked Area Flare? 9.13 How do I create a Area Spline Flare? 9.14 How do I create a Waterfall Flare? 9.15 How do I create a Funnel Flare? 9.16 How do I create a Pyramid Flare? 9.17 How do I create a Heatmap Flare? 9.18 How do I create a US Map Flare? 9.19 How do I create a World Map Flare? 10.1 How do I export a File to Browser? 10.2 How do I export as a Web Page? 10.3 How do I export a File to an Email Address? 10.4 How do I export to a Connector? 10.5 How do I export a PGP or GPG Encrypted File? 10.6 How do I compress a file on export? 11.1 How do I zoom in on a Chart? 11.2 How do I hide a group on a Chart? 11.3 How do I print a Chart? 11.4 How do I download a chart? 11.5 How do I move the Legend of a Chart? 11.6 How do I make a Column or Pie Drilldown Chart? 12.1 What are the Flow Elements? 12.2 How do I create a new Flow? 12.3 How do I save a Flow? 12.4 How do I modify a Flow? 12.5 How do I remove a Flow? 12.6 How do I create a scheduled Flow? 12.8 How do I create a Flow that is triggered when a specific Form is filled out? 12.9 How do I create a Flow that is triggered when another Flow is completed? 12.10 How do I create a Form from Flow? 12.11 How do I open a Form from Flow? 12.12 How do I modify a Form from Flow? 12.13 How do I add a Auto Import from Flow? 12.14 How do I modify an Auto Importer from Flow? 12.15 How do I create a Data Process from Flow? 12.16 How do I modify a Data Process from Flow? 12.17 How do I create a Custom Field from Flow? 12.18 How do I modify a Custom Field from Flow? 12.19 How do I create or modify a View or Flare from Flow? 12.20 How do I create a Export from Flow? 12.21 How do I Modify an Export from Flow? 12.22 How do I create a Dashboard from Flow? 13.1 How do I create a Workspace? 13.2 How do I add a Table to a Workspace? 13.3 How do I add a Form to a Workspace? 13.4 How do I add a Dashboard to a Workspace? 13.5 How do I add a System Tool to a Workspace? 13.6 How do I add a Business Proccess to a Workspace? 13.7 How do I edit a Workspace? 13.8 How do I remove a Workspace? 14.1 What are the Dashboard view Elements? 14.2 How do I add a Table View to a Dashboard? 14.3 How do I add a Chart to a Dashboard? 14.4 How do I add HTML Elements to a Dashboard? 14.5 How do I rearrange Elements on a Dashboard? 14.6 How do I remove Elements from a Dashboard? 14.7 How do I Share a Dashboard to others? 14.8 How do I change the Date Range of a Dashboard? 14.9 How do I share a Dashboard to other system Users? 14.10 How do I save a Dashboard as an Image? 15.1 How do I edit a Dashboard Element? 15.2 How do I see my Dashboard Element fullscreen? 15.3 How do I go to the associated view/chart of a Dashboard Elelement? 15.4 How do I download a view from a Dashboard Element? 15.5 How do I resize my Dashboard Elements? 15.6 How do I move my Dashboard Elements? 15.7 How do I close a Dashboard Element? 16.1 How do I fill out a Form? 16.2 How do I clear a form? 16.3 How do I Copy & Paste data into a Form? 16.4 How do I submit multiple entries into a Form? 16.5 How do I Create a User Specific Form URL? 17.1 What are the Dashboard System Tool Elements? 17.2 How do I create a Dashboard? 17.3 How do I edit a Dashboard? 17.4 How do I add a Dashboard Element? 17.5 How do I edit a Dashboard Element? 17.6 How do I remove a Dashboard Element? 17.7 How do I remove a Dashboard? 18.1 What are the Customer System Tool Elements? 18.2 How do I create a Customer? 18.3 How do I edit a Customer? 18.4 How do I add a logo to a Customer? 18.5 How do I add a website link to a Customer? 18.6 How do I change the MySQL password for a Customer? 18.7 How do I change the FTP password for a Customer? 18.8 Where is the PGP Public Key for a Customer? 18.9 How do I remove a Customer? 19.1 How do I create a user group? 19.2 What are the User Group System Tool Elements? 19.3 How do I edit a User Group? 20.1 What are the User System Tool Elements? 20.2 What are the User Admin Levels? 20.3 How do I create a new user? 20.4 How do I edit a User? 20.5 How do I create an Exception? 20.6 How do I create a User with access to Multiple Customers? 20.7 How do I remove a User? 21.1 What are the Folder System Tool Elements? 21.2 How do I create a Folder? 21.4 How do I remove a Folder? 22.1 What are the Table System Tool Elements? 22.2 What are the different types of tables available? 22.3 What are the different types of fields available? 22.4 What are the different options available for Conditional Formatting? 22.5 How do I create a Standard table? 22.6 How do I create a Table from Import? 22.7 How do I create a Horizontal Mashup Table? 22.8 How do I create a Vertical Mashup Table? 22.9 How do I create a Table using Custom SQL? 22.10 How do I convert a Mashup table to Custom SQL table? 22.11 How do I create a Table using Drag & Drop? 22.12 How do I edit the Table Info? 22.13 How do I edit a Field? 22.14 How do I remove a Field? 22.15 How do I edit a Conditional Format? 22.16 How do I copy a Conditional Format? 22.17 How do I remove a Conditional Format? 22.18 How do I copy the table with only the fields? 22.19 How do I copy the table including the data? 22.20 How do I remove a Table? 22.21 How do I add Values to a drop down? 22.22 How do I create Linked Dropdowns? 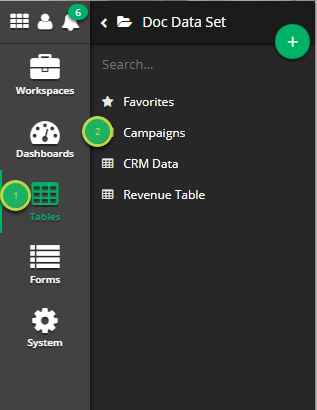 24.1 How do I create a table using an Adobe Campaign Classification Connector? 24.2 How do I create a table using an Adobe Data Classification Connector? 24.3 How do I create a table using an Adobe Data Warehouse Extract Connector? 24.4 How do I create a table using a Facebook Connector? 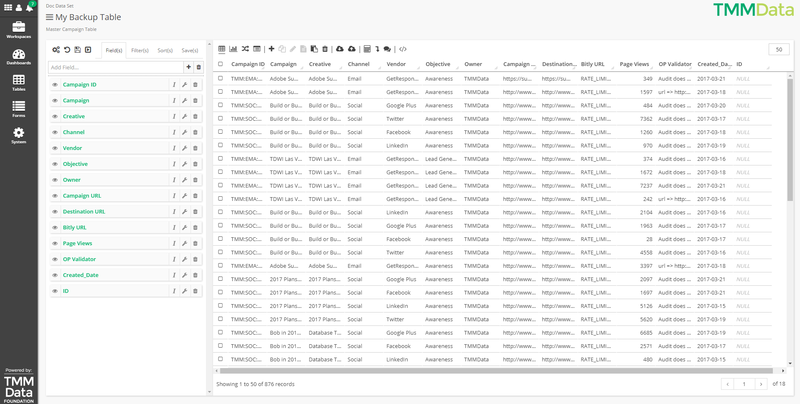 24.5 How do I create a table using a Google Analytics Connector? 24.6 How do I create a table using a Gigya Connector? 24.7 How do I create a table using a Google BigQuery Connector? 24.8 How do I create a table using a Google Streak Connector? 24.9 How do I create a table using a PostgresSQL Connector? 24.10 How do I create a table using a Redshift Connector? 24.11 How do I create a table using a Google Webmaster Connector? 24.12 How do I create a table using a Twitter Connector? 24.13 How do I create a table using a Youtube Analytics Connector? 24.14 How do I create a table using a Mongo Database Connector? 24.15 How do I create a table using a MsSQL Database Connector? 24.16 How do I create a table using a MySQL Database Connector? 24.17 How do I create a table using a Dropbox Connector? 24.18 How do I create a table using an Oracle Connector? 24.19 How do I create a table using an Email Connector? 24.20 How do I create a table using an FTP Import Connector? 24.21 How do I create a table using a Google Drive Connector? 24.22 How do I create a table using a SFTP Import Connector? 24.23 How do I create a Table using a Google AdWords Connector. 24.24 How do I create a table using an Adobe Data Warehouse 1.4 Extract Connector? 24.25 How do I create a table using the Bitly connector? 24.26 How do I create a table using a MailChimp Connector? 24.27 How Do I Create a New Table Using a Snowflake Connector? 25.1 Important: Change in mashup field functionality! 25.2 What is the difference between View Mashups in Grid View and Table Mashups? 25.3 How do I create a Basic Field Mashup? 25.4 What are the available functions, values, and options for Field Mashups? 26.1 What are the Form System Tool Elements? 26.2 What are the different types of Forms available? 26.3 How do I create a Form? 26.4 How do I add an Export API to a Form? 26.5 How do I remove an Export API? 26.6 How do I add Form Elements? 26.7 How do I edit Form Elements? 26.8 How do I remove a Form Element? 26.9 How do I copy a Form? 26.10 How do I remove a Form? 26.11 How to change the form so the submitter is user specific. 27.1 What are the Wizards System Tool Elements? 27.2 How do I create an Adobe Campaign Classification Connector? 27.3 How do I create an Adobe Data Classification Connector? 27.4 How do I create an Adobe Data Warehouse Extract Connector? 27.5 How do I create a Facebook Connector? 27.6 How do I create a Gigya Connector? 27.7 How do I create a Google Analytics Connector? 27.8 How do I create a PostgresSQL Connector? 27.9 How do I create a Redshift Connector? 27.10 How do I create a Google Streak Connector? 27.11 How do I create a Google BigQuery Connector? 27.12 How do I create a Google Webmaster Connector? 27.13 How do I create a Twitter Connector? 27.14 How do I create a Youtube Analytics Connector? 27.15 How do I create a Mongo Database Connector? 27.16 How do I create a MsSQL Database Connector? 27.17 How do I create a MySQL Database Connector? 27.18 How do I create a Dropbox Connector? 27.19 How do I create an Email Connector? 27.20 How do I create an FTP Export Connector? 27.21 How do I create an FTP Import Connector? 27.22 How do I create a Google Drive Connector? 27.23 How do I create an Oracle Connector? 27.24 How do I create an SFTP Export Connector? 27.25 How do I create an SFTP Import Connector? 27.26 How do I edit a Connector? 27.27 How do I remove a Connector? 27.29 How Do I Create a Bitly Connector? 27.30 How do I create a MailChimp Connector? 27.31 How do I create a Snowflake Connection? 27.32 How do I create a Gmail Connector? 28.1 What are the Plugins System Tool Elements? 28.2 How do I upload a Plugin? 28.3 How do I download a Plugin? 28.4 How do I remove a Plugin? 29.1 What are the Business Process System Tool Elements? 29.2 What are the Business Process System Tool Action Types? 29.3 How do I create a Business Process? 29.4 How do I create a Business Rule? 29.5 How do I edit a Business Process Info? 29.6 How do I edit a Business Rule? 29.7 How do I rearrange the Rules in my Process? 29.8 How do I copy a Business Process? 29.9 How do I run a Business Process? 29.10 How do I run a Business Process via URL? 29.11 How do I remove a Business Rule? 29.12 How do I remove a Business Process? 30.2 What is available in the Custom Field Environment? 30.3 What are some examples for Custom Fields? 31.1 What are the Scheduled Jobs System Tool Elements? 31.2 How do I set up a Scheduled Job? 31.3 How do I edit the Scheduled Job Info? 31.4 How do I edit the steps of the Job? 31.5 How do I remove a Scheduled Job? 32.1 How do I create a Theme? 32.2 How do I assign a Theme to a Form? 32.3 How do I assign a Theme to the User Interface? 32.4 How do I edit a Theme? 32.5 How do I duplicate a Theme? 32.6 What CSS selections do I have for Form Themes? 33.1 How do I use the Auto Import Wizard? 34.1 How do I create a System Notification?